Russian Hebraist; convert to Christianity; born at Wilna; died at Vienna June 5, 1883. According to some, Salkinson was the son of Solomon Salkind. As a youth, he set out for America with the intention of entering a rabbinical seminary there; but while in London he was met by agents of the London Missionary Society and was persuaded to forsake Judaism. Baptized soon afterward, he entered, in 1849, the college of that society, where he studied four years. His first appointment was as missionary to the Jews at Edinburgh, where he became a student at Divinity Hall. He was ordained a minister of the Presbyterian Church at Glasgow in 1859. He served his church as a missionary in various towns, including Presburg, and finally settled in Vienna (1876). Salkinson translated: "Philosophy of the Plan of Salvation," under the title "Sod ha-Yeshu'ah". (Altona, 1858); Milton's "Paradise Lost," under the title "Wa-Yegaresh et ha-Adam" (Vienna, 1871); Shakespeare's "Othello" and "Romeo and Juliet," under the titles "Iti'el ha-Kushi" (ib. 1874; preface by P. Smolenskin) and "Ram we-Ya'el" (ib. 1878); Tiedge's "Urania," under the title "Ben Ḳohelet" (ib. 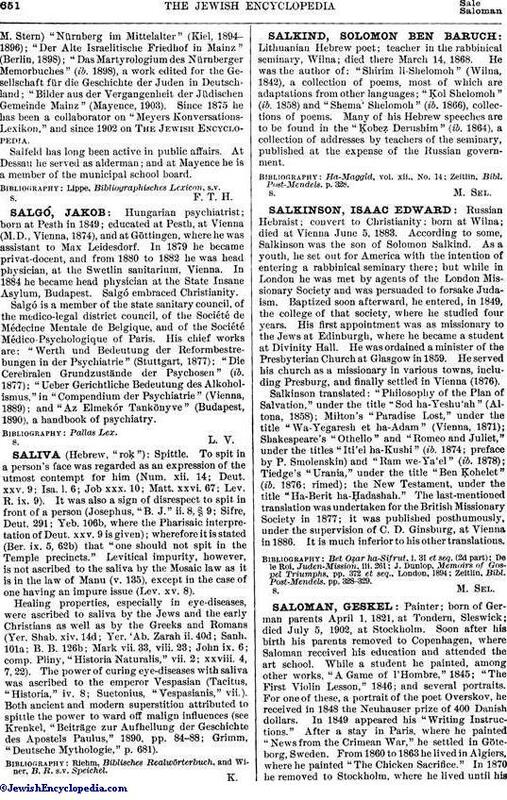 1876; rimed); the New Testament, under the title "Ha-Berit ha-Ḥadashah." The last-mentioned translation was undertaken for the British Missionary Society in 1877; it was published posthumously, under the supervision of C. D. Ginsburg, at Vienna in 1886. It is much inferior to his other translations. Zeitlin, Bibl. Post-Mendels. pp. 328-329.